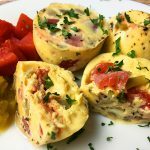 The Instant Pot has been an amazing device for making all kinds of delicious meals and these healthy southwest scrambled egg bites are one of my favorites! One of the biggest Instant Pot crazes lately has been the Starbucks Sous Vide Egg Bites. And i’ll be the first to admit – they’re amazing. Most of the recipes for making them in an Instant Pot, though not actually sous vide, but are just as delicious. While I enjoy them once in a while, the amount of cream and cheese often makes me seek out healthier options. This recipe will make a delicious southwest style scrambled egg bits in your Instant Pot in just a few minutes, without all the extra guilt of the other recipes. that everyone has been talking about. You can also use cupcake/muffin cups for this recipe. The portions i’ve used for this recipe are perfect for a 7-cup silicone mold but feel free to adjust as necessary. There’s not a whole lot of right or wrong. I start by using 5 eggs with just a couple of tablespoons of 2% milk and beat them in a large measuring cup (for easy pouring – but you can use the ladle that come with your Instant Pot as well). Then I have a can of diced tomatoes and a can of chopped green chilies. These are the perfect filling. Oh, and just a teaspoon of hot sauce. Eight minutes on manual, a quick release, and about 10 minutes to cool (important so they hold together), and you’ve got a delicious, healthier option to enjoy. Beat eggs and milk in a large measuring cup. Add salt, pepper and hot sauce. Place a small amount of diced tomatoes and diced chilies in the bottom of each silicone cup. Fill cups 3/4 with egg mixture. Add 1 cup of water to Instant pot, place trivet into pot and carefully lower egg mold onto trivet. Secure lid, set vent to “sealing” and select manual/pressure cook for 8 minutes. After cooking is complete, do a quick release and remove lid when pressure has released. Carefully remove egg mold/trivet and let let for 5 to 10 minutes before serving.